The small British manufacturers, Orchid Electronics, might not (yet) have built the kind of international familiarity that their competitors enjoy, but the quality of their products has always impressed as much as the value for money they represent. I reviewed several of the company's DI boxes in the May 2012 edition of Sound On Sound (http://sosm.ag/may12-orchid-DI) and found them to be exceptional. 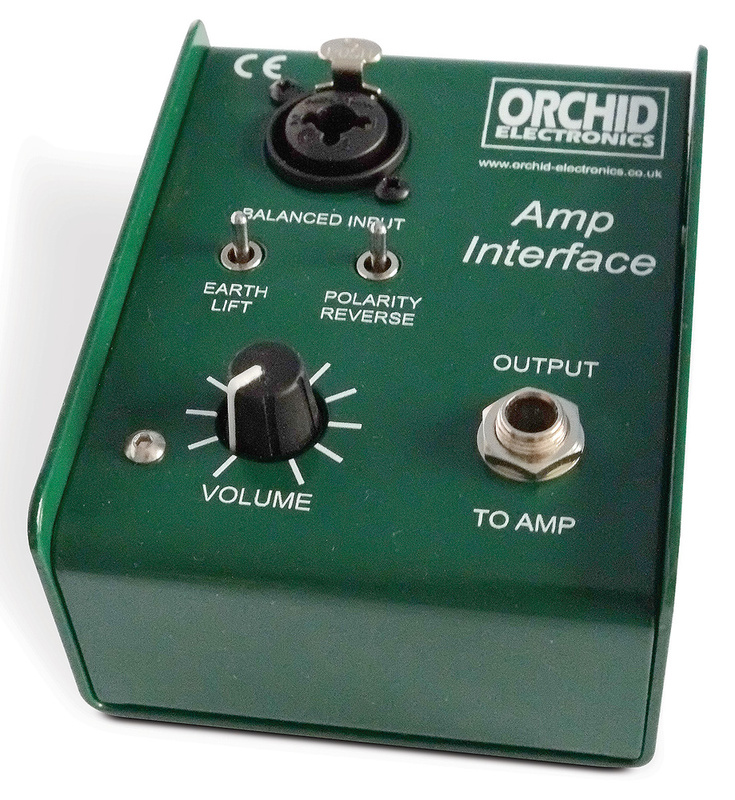 The product reviewed here is a revised version of the popular Orchid Amp Interface — or reamper, to use the popular parlance! Orchid's Amp Interface is an entirely passive device, and the circuitry is unchanged from the original model. What has changed, though, and dramatically so, is the external heavy-gauge metal case. The revised design employs a U-shaped steel outer case with a large non-slip rubber pad covering most of the base. The sides of this outer panel extend above the inner panel in a 'book-end' design, which protects the connectors and switches located on the top panel (although the volume knob stands slightly proud). This new metalwork is finished in a hard-wearing green paint with elegant white labels, and the quality is comfortably on a par with a certain well-known Canadian competitor. The only operational controls are an output volume knob to adjust the drive level into the instrument amplifier, a polarity-reverse switch (and correctly labelled as such, too, rather than the ubiquitous, but incorrect, moniker 'phase'! ), and an earth-lift switch, to prevent ground loops by isolating the XLR input ground from the case and output socket ground. The passive circuitry is very straightforward, starting with a Neutrik Combo socket that accepts a balanced line-level input signal (normally from a recording system) via jack or XLR-terminated cables. The input impedance is 10kΩ and the signal is immediately attenuated by 20dB before being passed to a miniature, high-quality, 1:1 isolation transformer made by Vigortronix. The unbalanced output from the transformer is passed to an ALPS volume control to fine-tune the signal level sent to the instrument amplifier. This allows the signal to be turned all the way down to silence, if necessary, and the connection to the instrument amp is, as you'd expect, via a quarter-inch unbalanced TS socket. Two miniature toggle switches with gold-plated contacts are provided to flip the signal polarity, and isolate the XLR earth connection from the case and output jack sleeve. As always with Orchid's products, the technical performance is exemplary. Measured on an Audio Precision system, harmonic distortion was negligible (0.004 percent, mostly third harmonic), even when driven with a +24dBu input. The frequency response was within ±0.5dB between 20Hz and 30kHz, with a hint of a typical transformer resonant peak around 80kHz. £56 including VAT & UK delivery.